I imagine for most people February 28th is just another day, marking the end of the month and the beginning of what we hope to be an early spring. Yes, February 28, 2014 is just another ordinary day; however, to millions of people worldwide—and me—this day is a special day. It marks Rare Disease Day. For those affected by a rare disease, this day is our day to shine. Rare Disease Day is our awareness day. To be considered a rare disease in the United States, the disease must occur in less than 200,000 Americans.¹ There are about 6,700 rare diseases affecting over 30 million people in America. Each disease may have a small number of people affected by it; however, combined the rare diseases outnumber some of the more known diseases such as diabetes. It is an impact that changes a person’s entire world. It changed mine and my family’s world, turning it upside down, bringing tears, anger, joy, love, and uncertainty. It also opened our eyes. One of my sons was diagnosed with not one, but two rare diseases at three weeks of age. Aaron was only home once in his first three weeks of life. He was plagued with relentless and progressive seizures, gaining in momentum from around 10 seconds to over 30 minutes in duration. What could cause such relentless activity? The rare diseases that changed my world were Ohtahara Syndrome and Hemimegalencephaly. I would have never guessed that the hiccups I was told about prior to birth were not hiccups but seizures. I would have never guessed that my sweet boy, a little over 5lbs, would face more challenges than many others would face in a lifetime. Our rare disease road has been full of twists and turns. My husband first noticed strange movements from Aaron the day he and his twin brother were born. These movements were explained to us as newborn reflexes that were perfectly normal–except these “reflexes” were getting worse. He stopped breathing while in the NICU, and it was at that time that his movements were diagnosed as seizures. 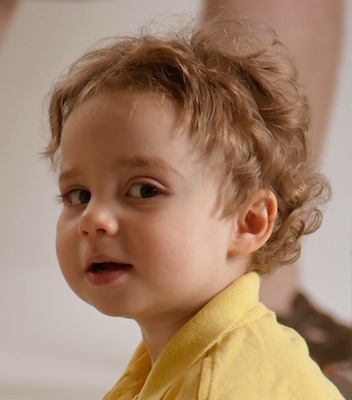 Our first encounters with physicians in the NICU led to phrases of, “I’ve never seen anything like this in forty years,” and, “ I don’t know.” We had nurses telling us Aaron wasn’t seizing that day, but when we were there he seized several times and the progression continued. Seizures in a newborn are rare, definitely unseen by the level three NICU staff and definitely misunderstood. We were told to take Aaron home and see our neurologist in a month. Both my husband and I were confused by the long wait so I called our neurologist the next day. I read from our seizure journal that I started a week prior and already could see further progression, but no rhyme or reason to his seizures. This information led to Aaron being admitted at a Children’s Hospital, and after three weeks of unanswered questions we received our rare disease diagnosis. The challenges faced when diagnosed with a rare disease go beyond the diagnosis. Some of the common challenges seen throughout the rare disease community are treatment options, research opportunities, services, and support. Many patients may not receive a diagnosis for years; others may never receive one. Many doctors and others in the medical field have very little experience, if any, with a rare disease. Diagnosing may be more difficult because there is little information or testing available. Whether there is a diagnosis or not, with a rare disease treatment options are limited, either by a delay in a diagnosis or a lack of research. Treatment options are few or ineffective due to a lack of complete understanding, research, or familiarity with the disease. Even therapies such as physical and occupational therapy, along with other services, may be limited when a patient has a rare disease. It is more than likely that a physician or therapist has never dealt with a particular rare disease and may not know where to begin on treatment or setting up continued care. Services may not be available or given to the patient due to a lack of guidance or treatment plan. Information about outcomes is also limited. Each patient may respond differently to a treatment, or an underlying condition may be unknown, leading to a range of outcomes or treatment effectiveness. When you have a rare disease, research opportunities are fewer than those for more common diseases. In my opinion, the more common diseases tend to be better understood. More research and education has gone into the disease or condition, along with more funding. It is a vicious cycle–without more research and awareness there is little understanding, and with less understanding there is less interest or opportunity for research. The rare community has seen progress that began with the initiative of some patient organizations that later formed into the National Organization for Rare Disorders (NORD). In 1983, President Reagan signed the Orphan Drug Act into law, “to encourage the development of treatments for the millions of Americans with rare diseases.” This opened the door to treatments for every person affected by a rare disease, then and in the future. Since its passing, the Orphan Drug Act has enabled more than 2,700 potential treatment options to be discovered, with over 400 being approved by the FDA. This is incredibly important for rare diseases. This year, Rare Disease Day is focusing on better care for rare diseases. This focus intends to “join together for better care,” and bring family, friends, patients, and the community together in an effort to seek care for a better quality of life. Rare diseases can be very different from each other; however, there are some commonalities that can lead to better care. These may include using medical equipment, participating in therapy, improving mobility, and improving access to physicians and care providers. Together, with millions of people joining throughout the world, better care can be achieved. This year, on February 28th, please remember Rare Disease Day. Although it may not affect you or a loved one, it does affect 1 in 10 Americans, over 60 million people in America and Europe, and millions more worldwide. If a rare disease affects you, please use this day and every day to bring awareness and understanding of the disease that has changed your world. This may be one day of national awareness, but it is the daily effects on your life that this one day is trying to bring into light. Share, become an advocate, and bring awareness of an otherwise rare and unknown world to your community. In the three years that I have been face-to-face with rare disease, I have learned so much about people. The challenges that may be faced scare us, yet these are the same challenges that drive us. It is through this drive that we find an inner strength and resilience to pick up and begin again, to seek better treatment, to find answers, and to live. I see this in my son daily, and I have seen it in many others diagnosed with a rare disease. Brianne McDonald has twin boys, who are now three years old. After Aaron was born and diagnosed with Ohtahara Syndrome, Brianne and her husband founded Aaron’s Ohtahara, a non profit organization created to offer family support, awareness, and research for those diagnosed with Ohtahara Syndrome. For more information on Ohtahara Syndrome, please visit www.ohtahara.org.